I’ll go ahead and admit it. I’m a yes man. I have an incredibly hard time saying no. I think there’s something in my DNA that affects something in my brain. I’m sure my nurse practitioner wife appreciates my technical medical terms there. I’m always so afraid that saying no will disappoint someone. And disappointing people is one of my greatest fears. I was totally one of those kids who could be crushed by my parents saying they we’re disappointed in me. (Fortunately, that didn’t happen too often.) Sure, spankings and punishment were rough, but them being disappointed in me was far worse. And yes, my parents spanked me (only when it was absolutely necessary) and I’m a perfectly well adjusted adult. So there. So, back to my yes tendencies. I’ve often overextended myself for the sake of someone else’s feelings. “Sure, I’ll bake 6 dozen cupcakes for the bake sale.” All the while thinking, I’ll just have to rearrange my full-time job, blogging, family, cooking dinner, baseball practice… You get the idea. But what I’ve learned is that my fear of telling someone else no, often ends up hurting me much more than a simple no would have hurt someone else. Piling too much on my plate, leaves me angry and burnt out. And then I’m good to no one – especially the folks that are closest to me. And I’ve done this with blogging too. When opportunities have come along, “Yes” it is! And there I go again, over committing myself. But I’ve also learned, that often when we say no to one thing, better things come our way. It’s not about being negative, but about being selective. There are certainly other people that can bake cupcakes, but I’m the only husband and daddy my wife and little boy have. So while I’m busy clicking away on my phone researching a recipe for a client, I might be missing my little boy hit a home run at practice. And speaking of my child, I think it’s good for kids to hear no too. As parents, we feel the pressure to give our kids everything they desire. But what ends up happening is we raise adults who think that they are entitled to have whatever it is they want. I’ve seen it happen. Kids who were never told no end up as adults who spend themselves into bankruptcy. Instilling in kids the philosophy that “money doesn’t grow on trees” and that you’ve got to work for the things you want is a hugely valuable lesson. We work to show Jack that money isn’t in endless supply and that sometimes we can’t afford things. And when that’s the case, I say “We can’t afford that.” And I try my best not to feel bad or guilty about it. We make him do chores to earn money for things that we feel are unnecessary or seem a little frivolous. Do I think you should never be able to blow money on something silly? Of course not. But you’ve got to have it to spend it and you’ve got to work for it to have it. So think about the power behind the word no. It’s often viewed with a negative connotation because the word is in fact no, but there are certainly some positive things that come from it. More time with family and friends, more well-adjusted children, and opportunities to take on something incredible… it’s all waiting for you. All you have to do is say that simple, two-letter word. Y’all this Cornbread French Toast is amazing. And the story behind it is a little funny. 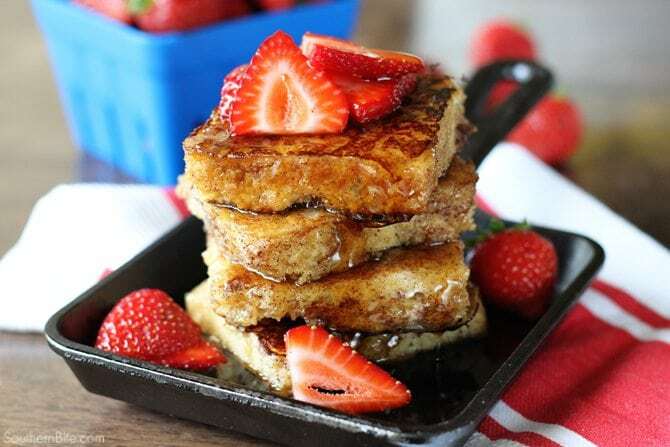 A few weeks ago, Heather texted me and simply said, “Cornbread French Toast.” She often texts me ideas, so it wasn’t something that out of the ordinary. 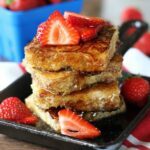 I had never thought about making French toast out of cornbread, so it didn’t put much thought into it that time either. (Shh… don’t tell her.) 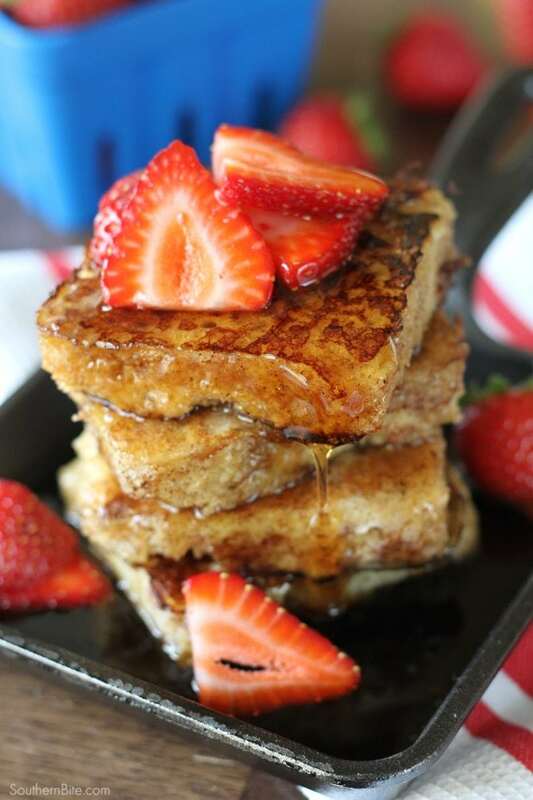 A week later, I get a text from my Mom, “Remind me to tell you about Cornbread French Toast.” Talking with her later, she mentioned that two ladies in the doctor’s office were talking about Cornbread French Toast and she thought it would be good. Here I was thinking these two were working together to get me to make something for them and they actually had no idea the other one had mentioned it. Taking this coincidence as I sign, I decided to work at creating my own version. After a little trial and error, the results were pretty fantastic. And that’s coming from someone who isn’t really a French toast fan. 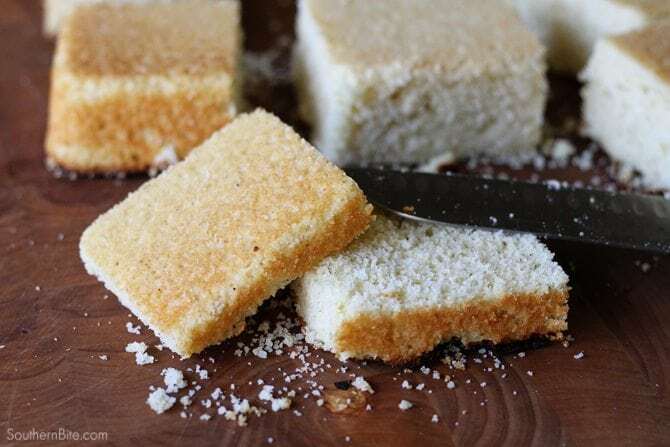 Now, this is perfectly delicious made with leftover plain cornbread (though leftover cornbread isn’t something that we see much of at our house), but I find that a sweetened cornbread just tastes better in this recipe. Don’t go all crazy with me talking about putting sugar in my cornbread. It’s just I’ve tested it both ways and I find the sweetened version better. I’ve included the cornbread recipe I used below. I bake it in a 8×8 or 9×9 inch baking pan, cut it into 9 squares, then cut the squares in half lengthwise (like the picture above) to get a thinner piece. It allows it to soak up more of the egg mixture so it has more flavor. Just keep in mind, really crumbly cornbread is going to give you trouble being that you’ve got to dip it in the egg mixture. I’d also recommend using a delicate hand doing the dipping and flipping. You don’t want a crumbled mess. The cornbread recipe below held up really well for this. And it’s great because you can bake the cornbread a day or so before and won’t have to wait for it to bake and cool the morning you want to make it. Y’all enjoy! Preheat the oven to 450°F. Lightly spray an 8x8 baking pan with nonstick cooking spray. In a medium bowl, beat the egg until well mixed and stir in the milk, oil, corn meal and sugar. Stir until combined, but don't overmix. Pour into the prepared pan. Bake for 20 to 25 minutes or until golden brown. Cool completely. In a small bowl, combine the milk, eggs, cinnamon, and brown sugar. Whisk until well combined. Slice the cornbread into 9 squares and then slice each square in half lengthwise to produce thinner squares. Heat a nonstick skillet over medium-low heat. Lightly butter the pan. Carefully dip the squares of cornbread into the egg mixture, gently shake off the excess, and place in the pan. (Don't allow the cornbread to soak in the mixture - just a quick dip.) Cook for 3 to 4 minutes on each side, adjusting the temperature to keep it from burning. (The sugar in the egg mixture will burn, so be cautious.) Repeat until all of the cornbread has been cooked, adding additional butter if necessary. Hold the other pieces in a warm oven to keep them warm. 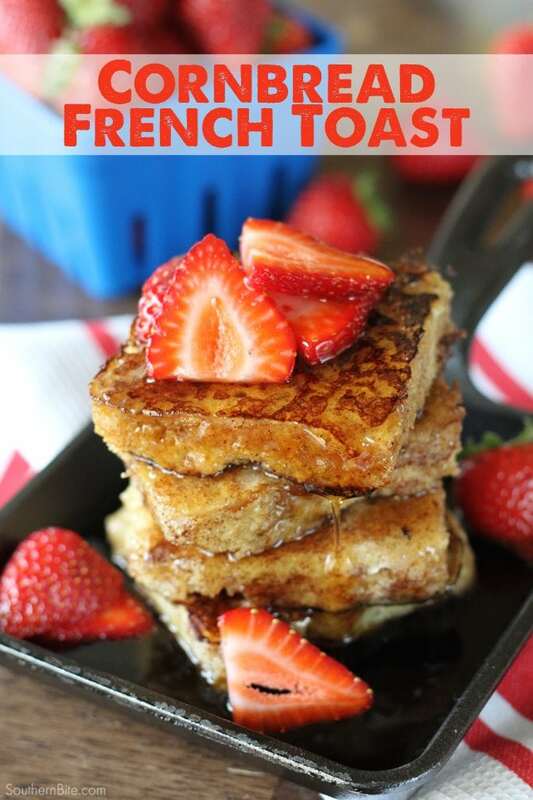 Serve with maple syrup, fresh berries, and a sprinkling of powdered sugar, if desired. You have piqued my curiosity and I have to try this! I like the sounds of this recipe for many reasons my husband loves his cornbread sometimes we have leftovers soo… this would be a another good way to use it up. 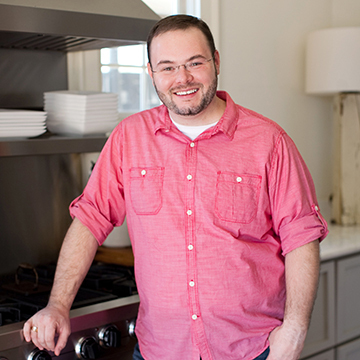 Thanks for your story and recipe. Of course! Hope you enjoy it, Debora! Please tell me you don’t put sugar in your table serving cornbread? I would be so disappointed. 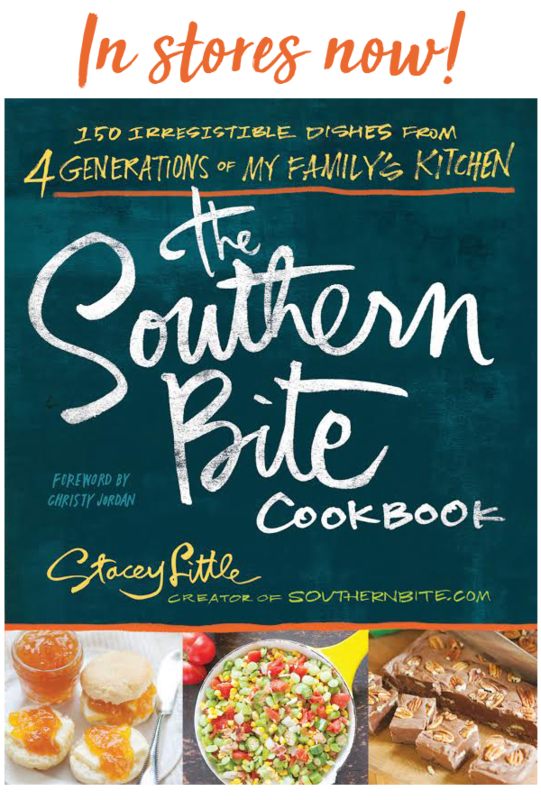 When I was a little girl helping in the kitchen my grandmother used to tell me sweetened cornbread was Johnnycake or the cornbread that Yankees made……..if they ate it at all. LOL I am 65 years old, probably the age my grandmother was when she told me all of this. I still miss that sweet soul. I make cornbread a lot and occasionally have some left over from a meal. If we don’t eat cornbread and milk with the leftovers I plan to try this recipe. Sounds great, I will twice bake instead, bake cornbread, cool, poke holes in bread with wooden spoon, mix egg mixture and pour over bread, bake at 350 degrees for 30 minutes or until set. I also did a twice bake, but did them in silicone muffin molds. Half full muffin corn bread, cool, pop out and fill with egg mix, squish your cornbread back in, pour leftover egg mix on top, bake 20-25 mins, add fruit and you’re set for meetings or brunch play dates! What a great idea. My son loves cornbread, and I sweetened it the New England way with maple syrup. I’m so glad you tried it and enjoyed it!